UPDATE: Metro patrol officers located Clinton Small in the care of a family friend who notified police at about 2:45 p.m. today. The 10-year-old was recovered in good condition and returned to his family. 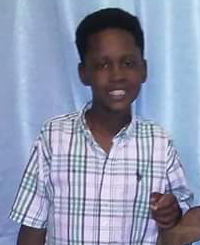 Clinton Small, Jr., 10, was last seen wearing the photographed shirt. 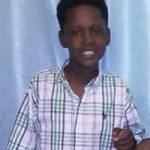 SAVANNAH, GA (June 4, 2016): Savannah-Chatham Metropolitan Police are searching for Clinton Small, Jr., a 10-year-old boy missing since about 10 p.m. Friday, June 3. Small’s last known location is Wells Park, on 39th and Montgomery streets. Small is described as a black male, with a medium length Afro haircut, standing 4-10 and weighing roughly 95 pounds. He was last seen wearing a white collared shirt with green and blue stripes, khaki cargo shorts and a pair of blue Crocs brand shoes. Small also speaks with a stutter. Small is known to frequent Wells Park and the 600 blocks of 40 and 39 streets. Anyone who sees Small should dial 911 immediately.